A Rule	evaluates input data to determine whether the data matches certain conditions. The rule returns the outcome, then it can pass this information to a flow, form, or a report. This outcome may direct which path a flow follows, determine which controls display on a form, or how certain values in a report are formatted. 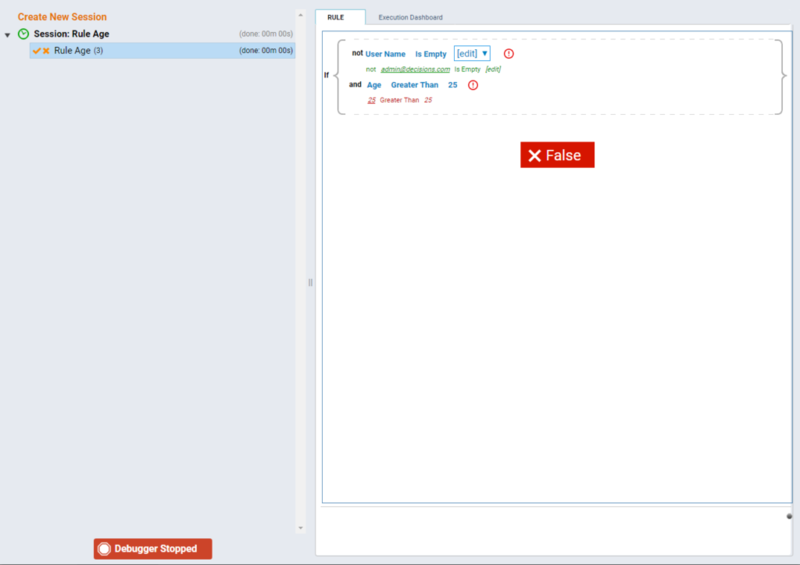 Rules are built in the Rule Designer . Navigate to a Designer Folder, click the Create Rule	button, and select Create Rule	. In the example, create a simple conditional rule that evaluates the account properties Username	and Age	. If the Username	is not null, and Age	is greater than 25, the rule will return true	. Otherwise the rule returns false	. The example assumes a Designer Folder already exists. To create the rule, navigate to a Designer Folder and click the Create Rule	button. Select Create Rule	. Name the rule and click CREATE	to open it in the Rule Designer . 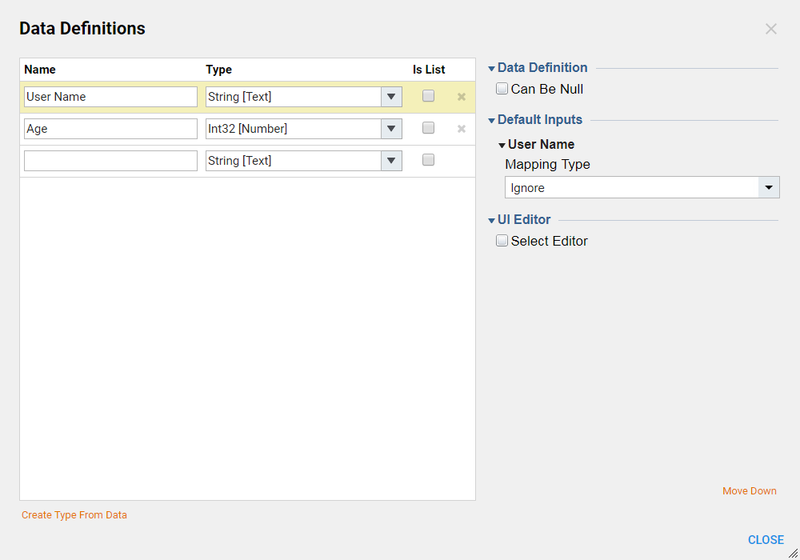 Next, define the input data type for the rule. The rule will accept two types of data: Username	(string) and Age	(integer). First, build the Username	input type. In the Start Rule	window, in the Rule Input	Data	section, click the Add New	button. In the resulting popup, enter a name for the Username	input, then click the Type	selector. Select String. Back in the Edit object popup, click Save	to save the input type. Repeat the process by adding an input type for Age	. 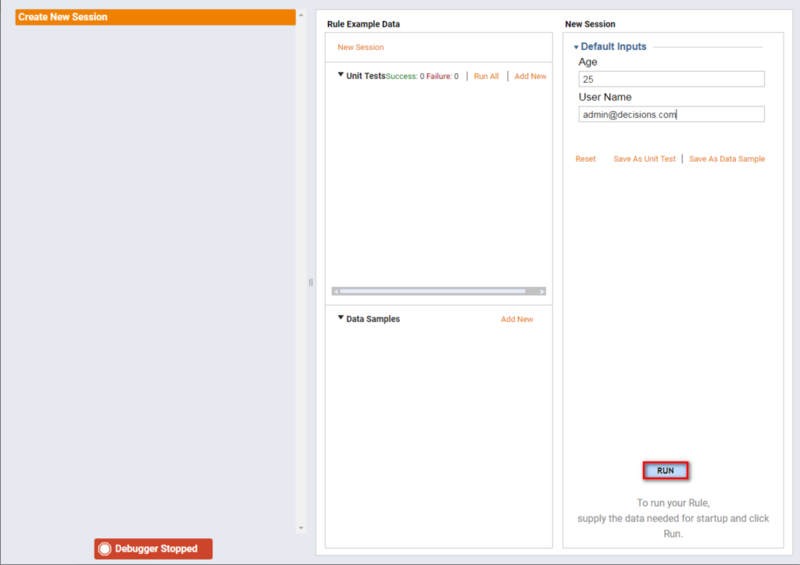 In the Start Rule	window, in the Rule Input	Data	section, click the Add	button. In the resulting pop-up, we enter a name for the Age	input, then click the Type	selector. Select Int32	, and click OK	.
Now that we&apos;ve defined our rule&apos;s input data, it&apos;s time to build the rule. In the Start Rule	window click Add New Rule Step	button. First, build the condition that the user name value is not null. Select User Name [String]	and click Next	. Expand the Text Rules	category, selectIs Empty	and click the Not	checkbox. This condition says that the username is not empty. Click Done. Next, build the rule that the age is greater than 25. Select Age	and click Next. Expand the Number Rules	category, select Greater Than	, and click Next	. Since this comparison requires another value, choose Constant	from the Mapping type	drop-down list, and enter 25 in the Value	field. Click Done	. The rule is complete. Click on Save Rule	. To test the rule, click on Debug Rule	. 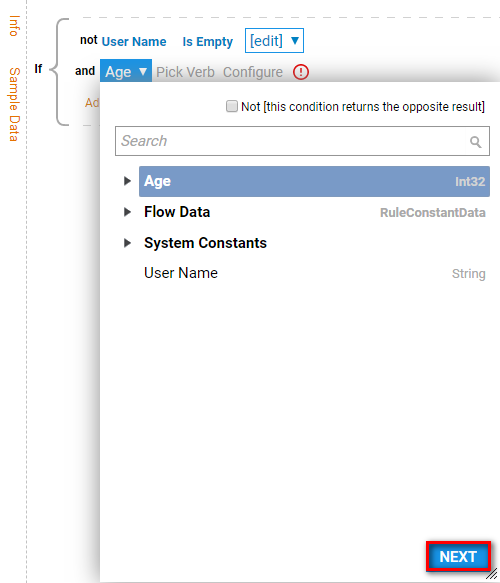 The rule needs data to validate so enter an appropriate age and user name in the Flow Input Data pop-up and click Run. The rule runs and the outcome displays.